Wavy Waters is the first underwater level in Wario Land: Shake It! It is played in a Subwarine and is located in Wiggly Wilds. Unlike most levels in the game, Wavy Waters does not require the player to run back to the beginning of the level to exit it. 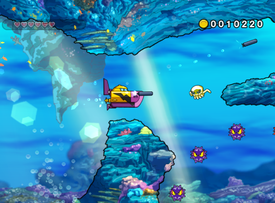 During gameplay, the player will be in a Subwarine underwater and maneuver through coral reefs. Near the end of the level, Wario will find a caged Merfle and will need to shoot it to move the cage between two walls. The walls will then close, displaying a pink button. Wario will need to shoot the strange button, However, enemies swarm around to destroy the Subwarine, making the button harder to hit. At some point, the wall in Wario's path will explode, letting him pass it and finish the level. This page was last edited on March 4, 2019, at 17:29.